In the demented mad science project that is Lockwasher Design you’ll find a treasure trove of fantastic ray guns, robots, rockets, and autos that are assembled from the sort of bin-diver’s paradise that we dream of. Well. Some of us. 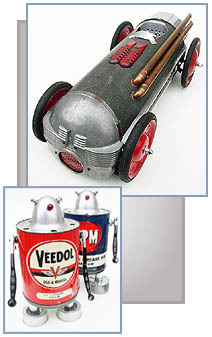 Vintage containers, Electrolux vacuums, spray guns, gauges and unidentifiable parts are here recombined into a retro-futuristic collection of bizarre and engaging sculptures. There’s a stand-alone gallery site and a larger series of Flickr streams, all full of these wonders. Partake. Via Boigboing, Via Neatorama, Via Aurelia. Nope, I got that last one from Rudyard Kipling. Via the Romans. I was working on a side project, a downright heroic propaganda poster for the Retropolis Fraternal League of Robotic Persons, when I did this side-side project spin off from the idea. The line “Although I am a servant, I am not your servant” is one that I read somewhere – I have no idea where – years ago. It’s always stuck with me. 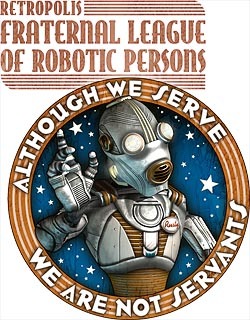 On this date in 2033, robots throughout known space collectively formed the Fraternal League of Robotic Persons – the first instance of a labor union for manufactured beings. This caused some confusion among biological citizens, none of whom had had to work for a living for decades – and in fact even the robots had labor-saving devices of their own. 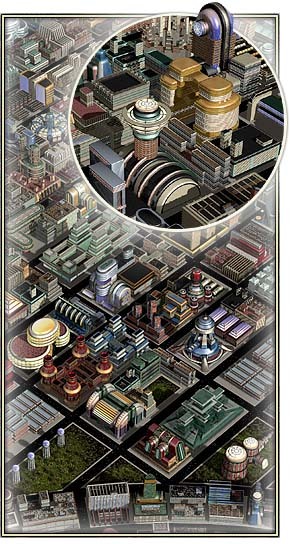 When asked why they felt compelled to unionize, the robots replied that they’d seen Metropolis and they weren’t taking any chances. So while my original big image isn’t done yet, I spun this version off into a poster, t-shirts, a clock (! ), mugs, and other gewgaws. You know me, I’m just like that. But I really ought to be working away at my City of Nova York. It continues to lumber on ahead at its own massive, deliberate pace. Steve Forde has added some new work in progress photos of Go Hero‘s upcoming classic Buck Rogers action figure. The latest are some views of the head and helmet. In fact since my last post about this, he’s also done some nice work on the gloves, shirt, and pants… and, come to think of it, the boots, too. The body sections are still based on an off-the-shelf action figure body and that’s due to change. (In fact I’m slightly confused about how that’s going to work. But “slightly confused” is pretty much where I live, so I’m not worried about it.) Looking good! All’s been preternaturally quiet around here, but there have been good reasons for that. I’ve been preoccupied with a couple of things that have kept me off the blog, you see. At left is one of those distractions. It’s a closeup, or at least closeup-ish, view of the City of Nova York from my Empire State Patrol comics project – the city is the largest set for the story and I started it nearly two years ago. I’m hoping that I might be finished with the whole of Manhattan Island in early July, on its anniversary. This is what I’ve called the “medium resolution” version of the city – the highest res at which the whole city would be visible – and it’s divided into large sections. The idea was that I’d use my low resolution version in the distance, and this medium resolution version closer in, with the addition of some “hero buildings” for the truly close-up bits that might show in a given image. Since I’m now on a much manlier computer than I was when I started I’ve begun to wonder whether I’ll need the low res version at all. We’ll just have to see. One thing that’s typical of something that takes this long is that I may need to go back and rework the earlier sections of the city. The newer blocks are more detailed and, though they use the same materials as the old buildings, they don’t quite match. I’m working on a large number of rectangular blocks that make up Nova York’s outskirts. At the center of the city – which occupies the area of what’s now Midtown Manhattan – the streets are laid out in concentric circles that ring the Empire State Building. That’s the one remaining bit of our old New York. My other recent distraction is an advertising campaign for my T-Shirt sites, Retropolis Transit Authority and Saga Shirts. I’ve had wonderful success this time around by advertising on webcomics and blogs – but online advertising is often a handy way to bleed money faster than you can count it, so the ads have taken quite a bit of my attention. Golden Age Comic Book Stories once again thrills! and amazes! 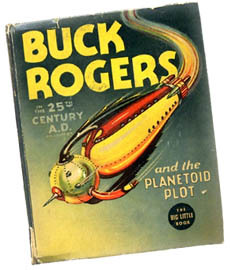 me with a collection of covers for Big Little Books featuring Buck Rogers, dating from 1933 to 1943.